Hi! My name is Bailey Clark, and I am a senior social work major at Spring Arbor University in Spring Arbor, Michigan about 10 minutes from Jackson. My university is just 30 minutes from my small hometown of Grass Lake, Michigan. When I say small, I mean it – with just over a 1,000 people living within the township and village limits. 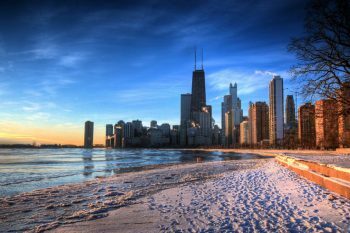 Growing up in a small town where everyone knows everyone and the nearest movie theater and mall were 30 minutes away is completely different to life in the big city of Chicago. If you would have asked me in high school if I would like to live in the city, I would have laughed even thinking about it. All my life, I have lived in the same place – went to school with the same people. I never changed my routine. Although I love my hometown and being close to my family, I was looking for something more to experience before graduation in May. I love to travel and experience new cultures and meet diverse people. Feeling this push by God to reach outside of my comfort zone, a staff member recommended that I consider Chicago Semester. At first, it seemed like a crazy idea. Besides traveling to different places around the world, I have never tried something so uncomfortable and unknown until I moved to Chicago. Now being here for the past month, I have found myself falling in love with the sights, sounds, and people of this city. I never imaged that this country girl who loved the wilderness and farming lifestyle could call herself a city girl. 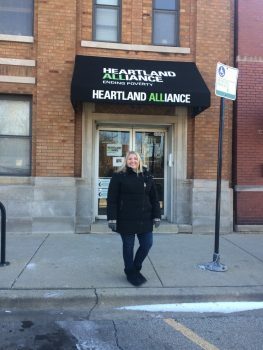 During my time in Chicago, I have been interning at Heartland Alliance. This is one of the largest non-profit agency within the Chicago area that was founded in 1888 with the help of Jane Addams, who is known as one of the first social workers and founder of the profession. Their main mission is to end poverty at every level. There are five different branches of Heartland Alliance that reach populations in need. The branch I am working with is called Refugee and Immigrant Community Services within the Youth and Family Services team. I work with children from pre-k to seniors in high school. I am an advocate and spokesperson for the children and their parents to help them navigate the education system, as well as provide social programs for youth to interact. I love working with diverse populations and helping our participants find a new beginning here in the U.S. My passion for diversity and people who are unique is what has driven me to this city filled with new ideas and experiences. The cultures, religions, and uniqueness of our participants experience are stories that I continue to hear and are amazed by. I won’t lie, I feared what was to come in the big city. I was unsure about everything. I did not know how much I would enjoy it. The experiences and people that I have met have shaped me into a better social worker, Christian, and overall individual. Every day, I continue to learn something new about the neighborhood and city in which I currently call home. If there is one thing I hope will stick with you from this post, it would be this: Take chances, make mistakes, and always dream big. You will never truly know who you are until you step outside of your comfort zone and experience the world in new and exciting ways. The world is full of exciting possibilities. Having a heart full of fear is not living. God’s perfect love drives out fear and He alone equips us for everything. So take chances and make mistakes because that is the only way we learn, grow, and truly know who we are!